Located at St. George's Town, Unfinished Church is an elegant edifice. As the name suggests, it's an incomplete church. 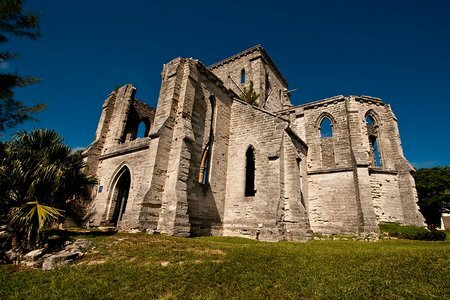 Its picturesque Gothic ruins is an important landmark in St. George's. The construction work began in the year 1874 when St Peter's Church was badly damaged by a storm and was thought to be beyond repair. So a new church had to be built to replace St. Peter's. William Hay of Edinburgh was the architect and he was a specialist in Gothic designs. Although the construction work of the new church was started, it could not be completed due to various reasons. One of the main reasons was strong difference in opinion within the parishioners. A local population felt that they would rather invest the money in repairing the old church instead of building a new one. Another faction separated out and built a different church close by known as the Reformed Episcopal Church which is now under the Salvation Army. There was also severe fund problems. In 1883, the Trinity Church in Hamilton City caught fire and was severely damaged. Funds had to be diverted to repair Trinity Church which could have been otherwise used to carry on the construction work here. The last known construction activity at the Unfinished Church took place in 1897 when the roof was installed. Nothing much could be done after that and the church remained exposed to harsh weather conditions without care. It was gradually getting to a state of disrepair. In 1926, when the church was still incomplete, a strong hurricane destroyed much of the construction work carried out until then. Today, the picturesque ruins are a protected historic monument and part of the St. George's World Heritage Site. Note that the location of Unfinished Church was the site of earlier Governor's House. The present one being at the outskirts of Hamilton and on North Shore road. When the church location was chosen, the earlier Governor House was then an abandoned site and in dilapidated condition. However the impressive gateposts today still reminds a resident about the entrance to the earlier Governor' House and its garden. Unfinished Church is owned by Anglican Church of Bermuda and managed by Bermuda National Trust. UPDATE (December 2010): The unfinished church has been closed to the public by order from Bermuda National Trust which is in charge of administration of this heritage property. Weathering due to wind and water has caused major structural deterioration causing risks to the visitors. Crumbling masonry is the main danger. The church will remain closed until repairing is completed. UPDATE (February 2013): Repairing work has been completed and the unfinished church is now open to public. The Unfinished Church is located at St. George's town on Blockade Alley off Government Hill Road. Bus Routes #1, 3, 10, 11 operate between Hamilton City and St George. While coming from the dockyard (Kings Wharf), you can take the direct Orange Route Ferry to St George (takes 35 minutes, this is the shortest route). However, the ferry has only limited runs and does not operate on Saturdays, Sundays, public holidays as well as during winter. Alternatively, take the Blue Route Ferry from dockyard to Hamilton City. From Hamilton, Bus Routes #1, 3, 10, 11 will take you to St George's Town (about 1 hour). Ferry fare is $4.50 by token and $5.00 by cash for both Orange and Blue Routes, and same for bus. You can also use a 14-zone ticket in both bus and ferry from a pack of 15 (pack costs $37.50). From Kings Square (town center of St George), it's a bit of an uphill walk to Unfinished Church (takes about 15 minutes). After about 40 yards from the square, take right into Kings Street and then left into Bridge Street, and then continue along Government Hill Road (aka Duke of Kent Street). You will pass by Somers Garden on the right and Historical Society Museum on the left. On the top of the hill you will find Blockade Alley and Unfinished Church. If you continue on Govt. Hill road, you will reach the beautiful Tobacco Bay Beach in another 10 minutes. 4) Check out Bermuda Sightseeing for many other great attractions in the island. The Old Unfinished Church was right next door to the school I attended in the early to mid 1950's, St. George's Preparatory School. During that time we had a Christmas program within the church walls. Hi, my name is Deandre and I visited the Unfinished Church on Saturday, May 3rd, 2014. My first thought was that it was going to be a bunch of junk but while walking around it I found some windows and it looked like a beautiful garden, it was a good experience for me. It's old but it turns out new. My mom took some pictures and she thought it was beautiful...and so did I. I believe that everyone should visit the Unfinished Church. I will be arriving on the Enchantment of the Seas in late August, 2012. Are tourists once again able to visit in the unfinished church, or is it still closed for repairs? Hi, There is no news yet on reopening of the Unfinished Church. The Bermuda National Trust's website continues to mention that it's closed. You can call up the trust (phone 441/236 6483) to know about the exact status and when is it likely to reopen. David asks if the unfinished church is still closed. Yes it is, however, that should not stop him from enjoying the views. 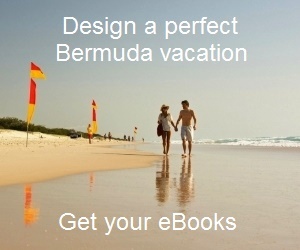 I just came back from Bermuda on April 22, 2012. My boyfriend and I walked right up to it. We walked the grounds around it and got some very wonderful pictures. Now you cannot get pictures from inside the building but that is not an issue. You cannot walk inside the church, but since it is 'open' on all sides, you can walk right up and peer into it and take your pictures from that vantage point. There is a sign on the gate to the entrance of the church that it is deteriorating and closed to the public, but not on the entrance to the property. A local actually directed us to it and insisted we could not leave without visiting it. We are so glad we listened to her.